Home→english→What to use instead of WhatsApp and Threema? WhatsApp is a messaging app for smartphones that allows you to send (text) messages free-of-charge. After WhatsApp’s recent acquisition by Facebook and in the face of the NSA revelations, many of the millions of WhatsApp users are looking for secure and trustworthy alternatives. Because this effects so many people, we at the Free Software Foundation Europe would like to be able to promote an alternative that respects your freedom and privacy. Therefore we decided to do some research and to hold a workshop on WhatsApp alternatives during our latest FSFE team meeting. While most tech-people really didn’t see the point in WhatsApp – after all there is Jabber/XMPP – we now understand better why it’s so popular: Seamless integration with the operating system and automatic contact discovery seem to be crucial features for the masses. We have to admit that encryption (OTR), group messages and file transfers, are not yet solved reliably or conveniently with popular XMPP apps. Of these, Threema seems to be quite popular and is recommended by many people although it is proprietary and therefore not trustworthy. And Telegram is proprietary on the server side, so we immediately ruled those two out. After all, the interception of communication (man-in-the-middle) is not the only surveillance scenario; the client software needs to be trustworthy and transparent for security as well. And depending on a single server definitely is also not the path to freedom. Surespot is Free Software, but it relies on the Google Play Services and doesn’t have automatic contact discovery through phone numbers, so we think it will probably not be competitive in the market segment that is currently dominated by WhatsApp. 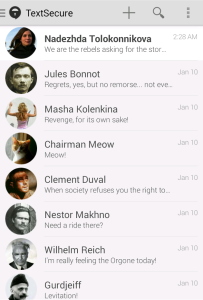 TextSecure and Kontalk are both good apps. However, TextSecure has a much larger adoption. It is integrated into CyanogenMod. Its protocol is better documented and has gone through more reviews. 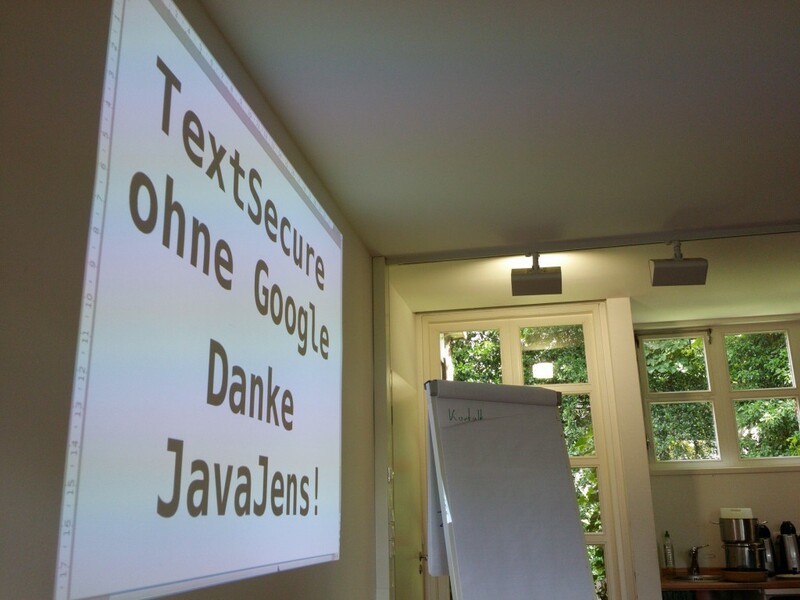 Just recently TextSecure gained lots of media attention and $400.000 funding. So we believe if we have a chance at migrating people away from WhatsApp at all, then TextSecure is the way to go. Unfortunately, TextSecure also still relies on the Google Play Services for pushing messages to you. So this does not work on phones that have been freed from Google, but is also unacceptable for many other reasons. As a consequence, we have started testing and supporting modifications to TextSecure that will provide an alternative mechanism for pushing messages. We are confident that the issue will be solved sooner or later (as the announced desktop and iOS clients will have to work with something else anyway), but if you have free time, please help the effort. Once this is achieved, TextSecure will be a great alternative to WhatsApp, easy to use, free as in freedom and respecting your privacy. Made at the German Team Meeting of FSFE in Linuxhotel.